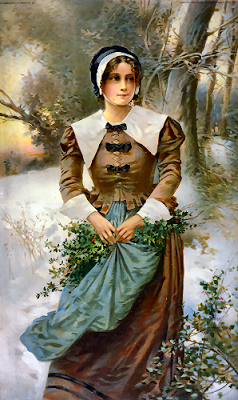 Temperance Flowerdew survived a hurricane at sea and ate rats for dinner, and she arrived in Jamestown in August 1609, just in time for the winter famine that followed. 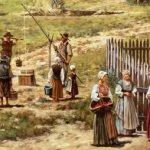 She lived through that harrowing winter, called the “Starving Time,” when over 80 percent of Jamestown’s residents died of sickness, disease, or starvation. In 1613, Temperance married Captain George Yeardley. He became one of the wealthiest men in Virginia. The couple had three children: Elizabeth in 1615, Argoll in 1617, and Francis in 1620, who died at a young age. In 1616, George Yeardley was designated Deputy-Governor of Virginia. 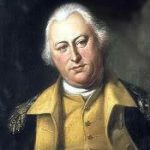 He negotiated an agreement with the Chickahominy Indians that secured food and brought peace to the colonists for two years. His term ended in 1617. The couple traveled to England, where George was knighted at Newmarket in November 1618. Six days later he was commissioned Governor of Virginia. He was granted 300 acres of land to help defer the cost of maintaining himself as governor. Temperance returned to Jamestown with her husband, Sir George Yeardley, Governor of Virginia. He also owned a private plantation of 1000 acres on the south side of the James River, which he named Flowerdew Hundred, in honor of his wife, Lady Yeardley. With a population of about thirty, the plantation was economically successful with thousands of pounds of tobacco produced along with corn, fish, and livestock. Sir George paid 120 pounds to build the first windmill in British America in 1621. The plantation survived an attack by the Powhatan Indians in 1622, losing only six people. It remained an active private plantation unlike many others in the area. Yeardley led the first General Assembly to meet on American soil, which convened at the church in Jamestown in July 1619. One of the first acts of this representative body was to set the price of tobacco. Sir George was appointed Deputy-Governor again in 1625, and he served a second term as Governor from March 1626 until his death in November 1627. He is buried in the churchyard at Jamestown, Virginia. 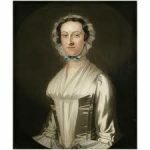 Lady Temperance Flowerdew Yeardley then married Governor Francis West, but she died the following year.